Valentine’s Day is not only for cheesy couples, but it is now for stylish tech-savvy people as well. Amosu, a London-based luxury phone brand is slated to release the “world’s first” pink iPhone 6, which features the same power-packed capabilities as a regular iPhone 6 but only with a more fashionable appearance. The pink iPhone 6 that is intended to be released on Valentine’s Day will look like something below. It appears stylish however the printed “WORLD’S FIRST PINK IPHONE 6” at the bottom appear a little tacky. It might be best to leave that out. Some reports say that it will be omitted on the final product to preserve its aesthetic value. This chic pink iPhone 6 does not come cheap. Upon launch, it is expected to have a price tag of£1,899 (~$2,893). 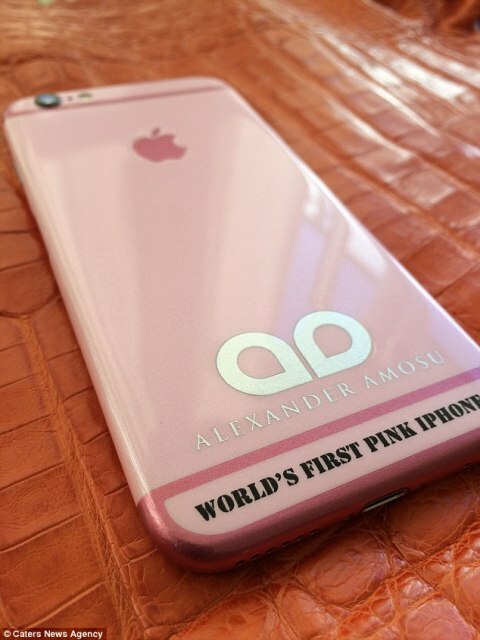 Amosu will only produce ten units of this pink iPhone 6. Thus, if you are a big fan of iPhone 6 searching for one and a bigger fan of the color pink, make sure you have some cash to splurge. It may be hard to come by and the opportunity to own one is very slim since it will be available in a very limited quantity. Amosu is also reportedly planning to release their own version of a gold iPhone 6, which will retail at a whopping £2,499 (~$3,807) price. Amosu is the same luxury brand that released a pink iPhone 5 during Valentine’s Day as well two years ago.